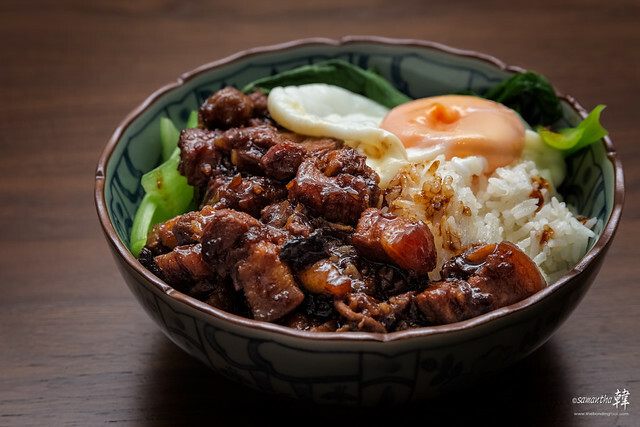 There are two offerings of Lu Rou Fan in Taiwan, diced pork belly (滷肉飯) and pork mince (肉脞飯). I love pork so I enjoy both styles. I also love to research recipes and see if anything could be done to level up my current formula. Et voilà, I did find something new for Taiwanese Lu Rou Fan Recipe, the inclusion of haebee a.k.a. dried shrimps! I gave this improved recipe a try on Wednesday and Bob’s your uncle! 5-spice Powder, Cardamons, Cloves and Star Anise. Hua Tiao Chiew (Shaoxing Chinese Yellow Wine). 500g Pork Belly, skin on, cut into bite-size pieces. 1 tablespoon Haebee (dried shrimps), rinsed, bashed and chopped coarsely. 1 cup Shallots, peeled and sliced thinly, then fry in oil till golden brown and crisp (drain away oil which you can keep for other dishes). 2 cloves Garlic, crushed, optional. 2 stalks Spring Onion, tie into a knot, optional. ½ teaspoon Chinese 5-spice Powder. 3 tablespoons Dark Soy Sauce. ½ – 1 tablespoon Light Soy Sauce. 1 tablespoon Yellow Rock Sugar cubes, or according to taste. You may use white rock sugar or granulated sugar if you can’t get this. ½ cup Chinese White Rice Wine. 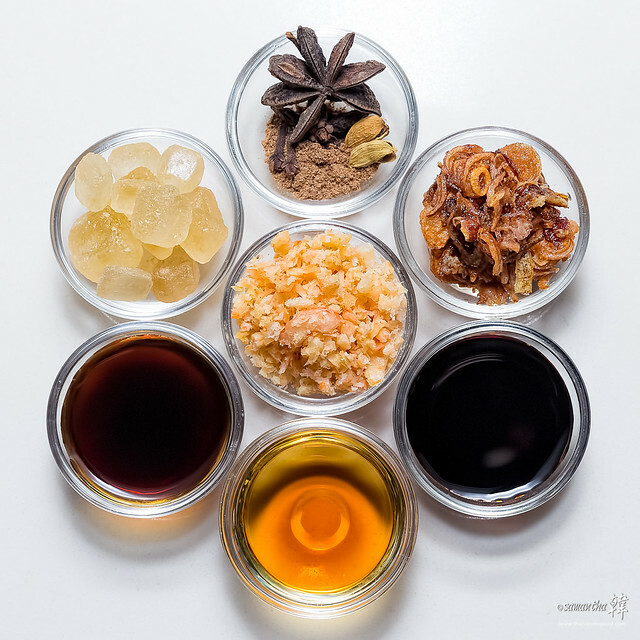 2 tablespoons Shaoxing Hua Tiao Chiew (绍兴花雕酒). Water, enough to immerse meat fully. A few dashes of White Pepper Powder, or to taste. 2 Cardamons, bashed lightly to crack. Eggs, hard-boiled, soft-boiled (can be cooked beforehand) or poached (when ready to serve). 1. Scald the diced pork belly with boiling water, give it a few stirs and drain water away. Repeat the process once or twice more to ensure scums and blood are removed. This process also makes the pork skin more springy. 2. 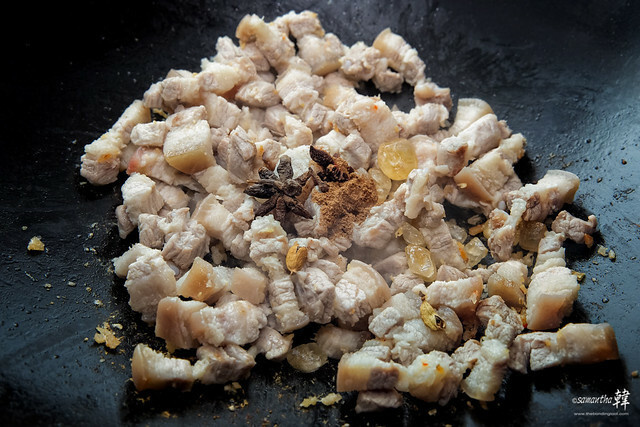 Fry the pork belly in a dry wok (no oil) till lightly browned then add dried shrimps. Stir-fry till fragrant before adding the rock sugar and all the spices including garlic and ginger, if using. Continue to fry till sugar melts and caramelise the pork pieces. 3. Add the knotted spring onions if using, the 2 types of *soy sauces, 2 types of wines and some water to cover the meat. Pour in the fried shallots and braise, covered on medium heat. Stir occasionally, remember to scrape the bottom of pan to prevent burnt and add more water if necessary until pork is tender (depending on the pork size and your liking, between 30 to 90 minutes). Add boiled eggs to the pork (for colour) during the last 10 minutes of cooking, if using. 4. 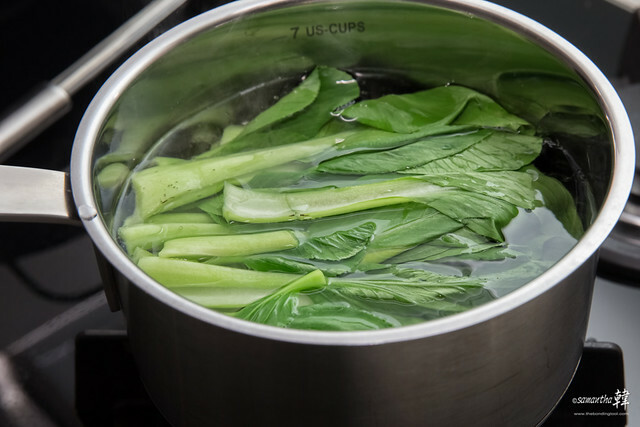 Blanch vegetables with a little sugar, optional, in a pot of simmering water. The sugar helps the vegetable maintain its bright green hues. Drain away water. 5. Taste and adjust final seasoning. 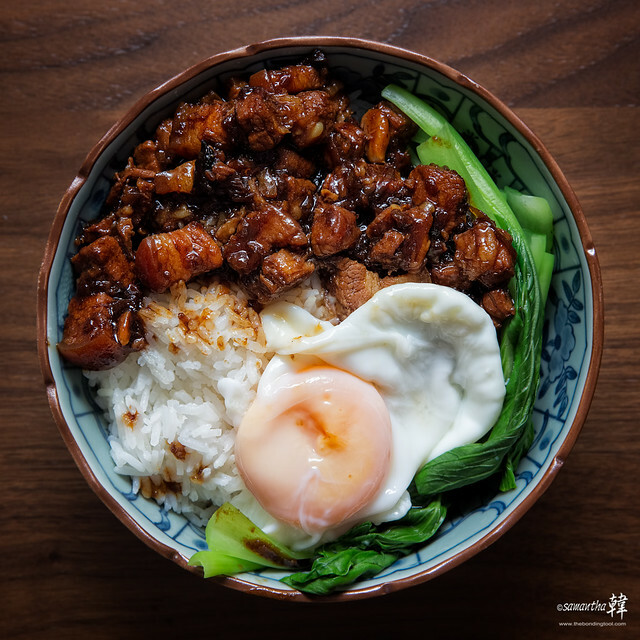 Serve braised pork over a heap of steaming rice, garnish with greens and egg and, for Singaporeans, bring out your sambal belacan! Note: *Always taste your food while cooking and adjust accordingly! Taiwanese dark soy for braising (unlike our local brands) aren’t salty, so please exercise discretion and use dark and light soy according to taste. The measurements given are guidelines as we may not be using the same brand and even the same manufacturer can produce inconsistent batches due to materials. Drizzling wine around the wok instead of pouring directly onto the food will evaporate the alcohol content and heighten its aroma! 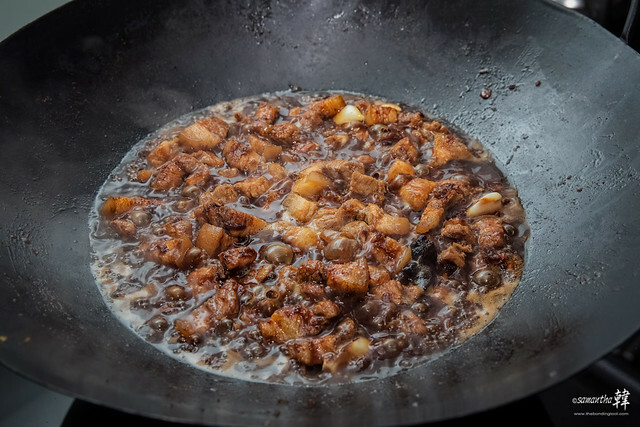 Scald the diced pork belly with boiling water, give it a few stirs and drain water away. Repeat the process once or twice more to ensure scums and blood are removed. This process also makes the pork skin more springy. Other Ingredients used are White Rice Wine, Garlic and garnishing like Greens and Eggs. You may also include taukwa/taupok but that’ll be very Singaporean! 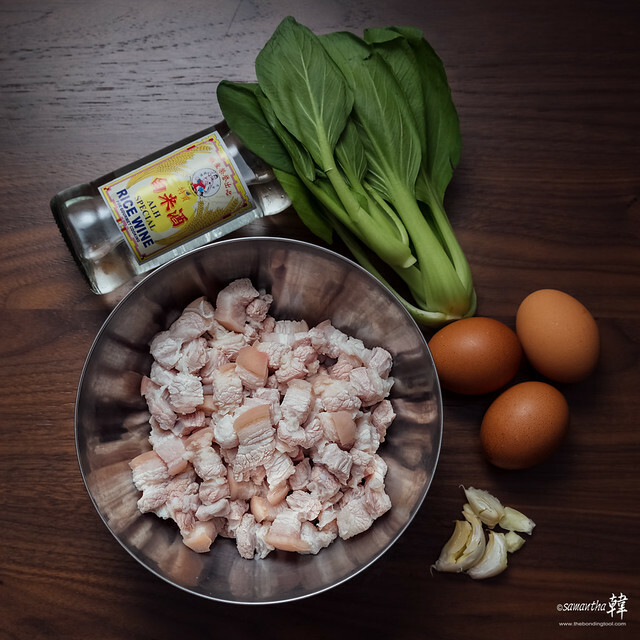 Fry the pork belly in a dry wok (no oil) till lightly browned then add dried shrimps. Stir-fry till fragrant before adding the rock sugar and all the spices including garlic and ginger, if using. Continue to fry till sugar melts and caramelise the pork pieces. Add the knotted spring onions if using, the 2 types of soy sauces, 2 types of wines and some water to cover the meat. Pour in the fried shallots and braise, covered on medium heat. Stir occasionally, remember to scrape the bottom of pan to prevent burnt and add more water if necessary until pork is tender (depending on the pork size and your liking, between 30 to 90 minutes). Add boiled eggs to the pork (for colour) during the last few minutes of cooking, if using. Blanch vegetables with a little sugar, optional, in a pot of simmering water. The sugar helps the vegetable maintain its bright green hues. Drain away water. I prefer soft egg with runny yolks so I poached them instead of hard-boiling. One bowl meal makes cleaning up easy! Use mince meat with 10 – 20% fats, or lean mince with a little oil when frying. The braising time is around 30 minutes. You may substitute with cubed boneless chicken thighs with skin on, instead. And use a bit of oil since chicken thigh is not as oily as pork belly. Braising time is also shorter. Muslim friends or those abstaining from alcohol can omit the wines altogether. 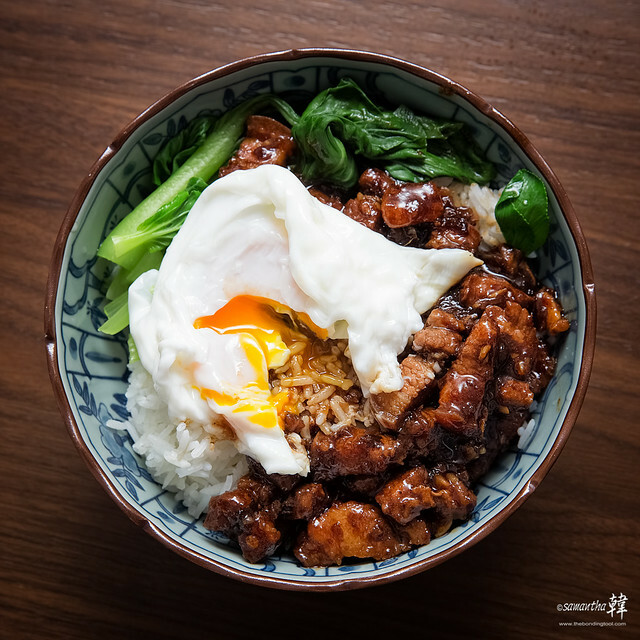 I’m Taiwanese and this recipe is very authentic, as far as I can tell!